I am sure most of us are familiar with Lee Kum Kee’s sauces! For me, it simply reminds me of childhood dishes my nanny would cook for us! Lee Kum Kee is a brand with 126 years of history, however, it doesn’t stop them in their efforts to ensure quality and come up with new sauces. They have recently introduced 5 new sauces and soup base to their Menu-Oriented series, that would allow us to whip up restaurant-quality meals in just 3 easy steps! I am imagining busy mums like me, trying to prepare 3 dishes and 1 soup in 30 minutes – at the same time taking care of a baby – it must be quite disastrous lol. While looking at these sauces and soup base, I really want to try the Drunken Chicken Hot Pot! It states “Premium Chinese fine wine, with a blend of aromatic spices, making up the main ingredients. Once brought to a boil, the aroma of this Shanghai-style soup base will waft through the air”. 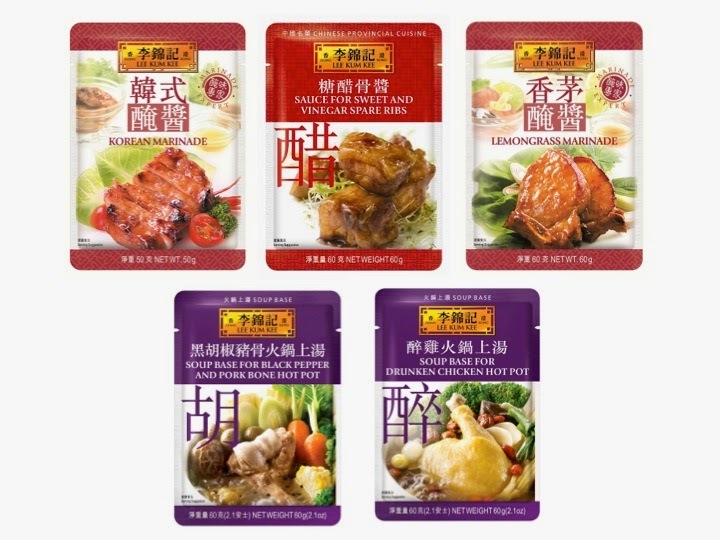 Lee Kum Kee’s Menu-Oriented sauces are available at all leading supermarkets chains and selected grocery stores at the recommended price of S$1.90 per pack. P.S. : Check out the posts of other bloggers using the above sauces to create 3 dishes and 1 soup at home: Honey Bee Sweets, Cuisine Paradise, Working with Grace.